Lock in a great price for Rainforest Haven Inn – rated 9.1 by recent guests! Location was fantastic. Rooms were clean and quiet and met all of our expectations. basic, but excellent. aircon, 2 big beds in room, close to amenities, hotel staff VERY helpful. VERY happy. From the outside, it doesn’t seem like much but this is a great little gem in San Ignacio. We had to change our plans last minute, and ended up booking a couple nights here. Make sure you get some hot sauces!! They have so many to chose from. Everything is walkable from the hotel and even at night we were fine walking around everywhere. The hotel itself was clean and comfortable and safe. It’s also super close to lots of ruins and Guatemala!! Terrific staff. Location was a short walk into town with good restaurants and the outdoor market place. Roof top terrace was nice. Very clean, wonderful outdoor relaxation places on the roof, fun store and cooking courses. The staff was SO nice! The lobby and room were so clean, and they have a wonderful and peaceful rooftop area with wonderful views and much seating. Our room had a balcony and the most comfortable beds I've found in Belize. The staff was friendly with good suggestions about where to go. The room was large, comfortable bed, good air conditioning. Location is great and for a great price. We split our trip, half in San Ignacio and half in San Pedro. This location is perfect for seeing Maya ruins, ATM cave tour, and experiencing local culture. Wonderful location, clean and comfortable. The view from the rooftop terrace with hammocks and 2nd floor balconies is spectacular. There is a full shared kitchen. Staff are helpful. Laundry was inexpensive. Room Wi-Fi strong and quick..
Staff was extra helpful. Comfortable bed, a/c, great WiFi.. When would you like to stay at Rainforest Haven Inn? This room features 2 Double-sized beds, cable TV and air conditioning. You will also find a private bathroom with shower. The apartment comes with a fully equipped kitchen and a full bathroom. The master bedroom features a Queen-size bed, futon, cable TV and air conditioning. The smaller bedroom comes with a Queen-size bed, cable TV and a fan. This room offers 2 Queen-size beds made from tropical trees. It is equipped with cable TV, rocking chair, and a fridge. Guest also have access to the terrace that has a 360 degrees view of San Ignacio. House Rules Rainforest Haven Inn takes special requests – add in the next step! Rainforest Haven Inn accepts these cards and reserves the right to temporarily hold an amount prior to arrival. Only complaint was that there was no secure safe in the room to store our more sensitive possessions. Hotel was in a great location, everything was 250 meters or closer (walking distance to everything which includes tour agencys, restaurants and convenience stores). Room and bathroom were very spacious and beds were comfortable. Has a great AC unit to cool you down from that Belize heat. Price was one of the best around that area. Beds were a bit squeaky and not the most most comfortable, but a great value for the price. Room is a bit dark with only small windows - other than that, very recommendable! No major complaints, no minor complaints. It would be nice to have a safe in the room. The location of the Inn was right in the town of San Ignacio. Could not have asked for a better location. The staff was always soo helpful. Martin and Selvin was always willing to provide advice and show us the terrace and the great view of the city. Of course the wine tasting was a great choice. Thank you very much for a wonderful time and stay. They pointed out good locations to have breakfast, lunch and dinner. Tried a few of their recommendations and both were excellent. We had a difficult time regulating the water temperature in the shower. It certainly could have been user error. Nothing. This went way beyond my expectations. Cannot recommend this place enough! It is perfectly close to downtown and the Cahal Pech ruins. The rooftop has hammocks where we relaxed and had a great view! 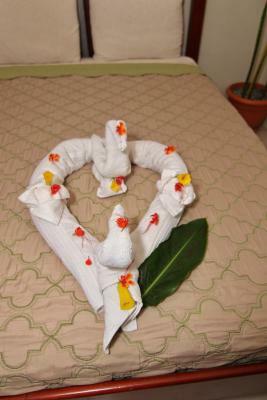 Very friendly staff, Perfect Location in the City center of san ignacio. Highly recommended! The tours booked with the hotel are really good and the staff is super friendly. Very nice terrace on the roof top.